"That's the third time that's happened!" Number 6 was a prisoner on The Island. Along with the others, Number 6 was held kept prisoner on The Island "because we know too much." In Number 6's case, he was sent to The Island because he had invented a bottomless peanut bag. He secretly built an escape boat out of toilet paper rolls, toothpicks, plastic forks, scabs, and dynamite, but the boat was eventually stolen by Homer Simpson. This had apparently happened to Number 6 twice before. 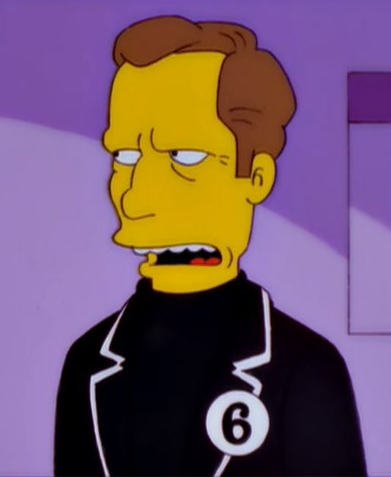 Number 6 is McGoohan's character from the 1960s television series The Prisoner. Modified on May 17, 2016, at 12:16.